1 oz Graduated Medicine Cup with Lip by Medi-Pak is a straightforward, easy-to-use medicine cup that's simple for people of all ages to grasp and to use. 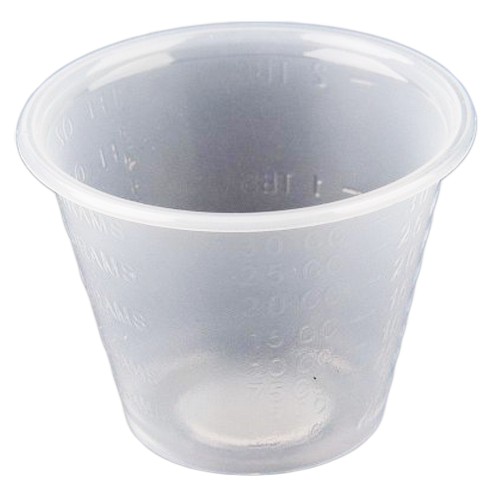 This medicine cup contains a small lip and is intended for single patient use. 1 oz Graduated Medicine Cup with Lip by Medi-Pak is not made from natural rubber latex and is available in a clear, transparent color to allow for easy viewing of contents. You may also be interested in similar medicine cups, such as Souffle Cups Paper. Great price especially if you have to use these everyday. They have a lot of measurements on a small cup so I have to mark my 5 ml with a sharpee so my husband can see it but you can't beat this deal.